If you're like me and don't belong to a gym or boutique studio, figuring out your workouts can be a bit of a challenge. Although there are many fitness options out there, I can get overwhelmed trying to find a place to squeeze in a sweat session during lunch or on a random Saturday afternoon. That's where Classtivity comes in. If you're like me and don't belong to a gym or boutique studio, figuring out your workouts can be a bit of a challenge. Although there are many fitness options out there, I can get overwhelmed trying to find a place to squeeze in a sweat session during lunch or on a random Saturday afternoon. That's where Classtivity comes in. The site lets you try 10 fitness classes in your community--at different studios--for just $49 a month. (Just be warned--you may be put on a temporary waiting list like I was, or you may not be able to find classes if Classtivity isn't in your town or city yet). I sat down with Payal Kadakia, CEO of the group fitness booking site, to find out more about Classtivity and why she launched the site. "I was trying to find a dance class after work but after poring over many sites and trying to coordinate schedules and mapping and scrolling, I gave up and didn't end up going." That's when she had her eureka moment: "I thought, 'why not start a site that makes fitness more accessible with the flexibility to try classes at many studios?'" And that's how the site--which has already made more than 20,000 class reservations in NYC alone--was born. I was able to try out the site and loved that I had so many classes to choose from. I took a meditation and chanting yoga class that had me blissed out for hours after! One note of caution: space can run out quickly because Classivity fills the studio's vacancies, so there might only be one or two spots left. I was never able to find a class the same day that I had a sudden urge to get moving, so plan ahead. Also, after you try a studio during the 10-class tryout, you can't go back again. While I was bummed that I couldn't do another spin class at the same studio, the whole point is to try different places. So getting out of my comfort zone and trying new things ultimately made me want to keep working out! It's super easy. The Passport option lets you try 10 classes for $49 in a 30 day period. You'll have access to 34 different studios with options ranging from Indian dance to more traditional Pilates. 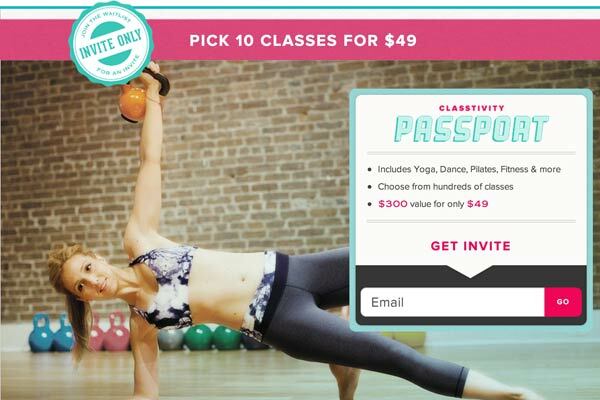 After that, you can continue to use Classivity through ClassPass, a monthly subscription pass for $99, that gives you a wider range of availability at more popular studios such as Barry's Bootcamp and Exhale. We want to get people moving by giving them lots of boutique studio options. Gym memberships don't work for everyone--67% of people with an active membership don't even use it. Guilty! What makes this membership different? I think the best part is you don't have to commit to one place. Any fitness expert will tell you that variety is a key part of any workout regimen. And you can get out of your comfort zone to try something that maybe you've never tried before. How many studios are included? Tons! You can get in an intense sweat session at bootcamp or spin class, channel your inner dancer with barre or Zumba, zen out with a relaxing yoga class, or try something completely different like aqua spinning or martial arts, it's up to you. We have more than 100 boutique studios including big name places like Barry's Bootcamp, Revolve, Pure Barre, Yogaworks, and Exhale so it's easy to switch it up and you won't be bored with the same routine. So much, we're really excited. We're currently only in New York City, but are planning to expand to Los Angeles, DC, and San Fransisco. But we want to be more than just a virtual gym and are looking into features that would recommend new classes to our users based on what they've taken already as well as become a bigger community. So many of our users meet other members and then plan workouts together and we want to make this social process easier. I'm currently into barre classes--you'll find me at FlyBarre at least a couple times a month.